Greater supplies of natural gas, the cleanest-burning fossil fuel, can help to meet growing energy demand. Liquefied natural gas enables natural gas to be easily transported from remote areas to distant markets. the Geoje shipyard, South Korea. We were a pioneer of the liquefied natural gas (LNG) industry five decades ago and, today, we are one of the largest LNG suppliers. The LNG process cools natural gas to -162 ºC to turn it into liquid and shrink it in volume by 600 times, allowing us to transport it around the world. At its destination, the LNG is turned back into gas for our customers. We have a share in 10 operating LNG plants worldwide, and are currently working on a number of LNG projects to grow this portfolio. In late 2013, the 700th LNG cargo left the Sakhalin-2 LNG plant (Shell interest 27.5%) in Russia. The plant provides nearly 9% of Japan’s LNG supplies and 4% of South Korea’s supplies. Shell developed a technology designed to help cool natural gas for liquefaction in the subarctic conditions of Sakhalin. The process reduces the amount of natural gas used to run gas turbines by using low ambient temperatures for cooling. The waste heat generated in the liquefaction process is used as a heat source for the treatment process, improving energy efficiency. Sakhalin-2 is around one-third more energy efficient than an average LNG plant. Shell, Korea Gas Corporation, Mitsubishi Corporation and PetroChina Company Limited have agreed to examine the development of a LNG export facility (Shell interest 40%) on the west coast of British Columbia, Canada. The project includes the design, construction and operation of a gas liquefaction plant, and facilities for the storage and export of LNG. If it proceeds, it will connect the abundant supply of Canadian natural gas to growing markets around the world. In Australia, around 50 km off the north-west coast, the Gorgon LNG project (Shell interest 25%) is under construction on Barrow Island. The Greater Gorgon fields are the largest gas discoveries in Australia to date. The project will include capturing carbon dioxide (CO2) produced with natural gas, that would otherwise be released into the atmosphere, and storing it safely underground. It is expected to capture and store 3 to 4 million tonnes of CO2 a year, more than 2 km beneath Barrow Island. Shell is developing a facility that enables us to produce, liquefy, store and transport LNG at sea. Floating LNG (FLNG) offers access to offshore gas fields that would otherwise be too costly or difficult to develop. 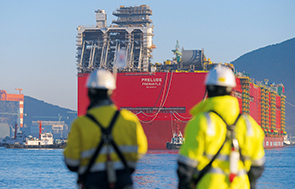 FLNG eliminates the need for pipelines, onshore plants and infrastructure. Our first project, Prelude FLNG, is currently under construction in South Korea. It will be used to develop the remote Prelude gas field off the coast of Western Australia. We are investing millions of dollars in Australian universities and other educational institutions to build local expertise to support the Prelude FLNG project. This includes working with the University of Western Australia’s Energy and Minerals Institute to strengthen research in the impact of weather and ocean conditions on offshore gas installations and operations. LNG is emerging as a cleaner fuel for road transport and ships. Shell is developing an LNG for shipping business: we bought Gasnor in 2012, a Norwegian firm that supplies LNG as a fuel to shipping companies and industrial customers. In 2013, Shell started chartering Greenstream, the world’s first 100% LNG-powered barge, to carry goods along Europe’s River Rhine. It carries diesel, heating oil and unleaded petrol to customers in the Netherlands, Belgium, Germany and Switzerland. Greenstream produces fewer emissions and makes less noise than conventional vessels – an important factor when travelling through populated areas. A second LNG barge, Greenrhine, was chartered in the Netherlands in late 2013. In 2013, we announced an agreement with construction equipment company Caterpillar to test a new type of truck engine at our oil sands operations in Alberta, Canada that will run mainly on LNG rather than diesel. If successful, this will help to reduce emissions at our oil sands operations. Shell is working with transport companies to create an infrastructure for LNG-fuelled trucks to travel across the USA and parts of Canada. We are planning to introduce LNG fuelling stations for trucks in the Netherlands in 2014. Our gas-to-liquids (GTL) technology makes it possible to use natural gas, rather than crude oil, to make a range of liquid products. These include cleaner transport fuels and materials that are used to make chemicals and lubricants. They can be blended with existing fuels or used in pure form. GTL fuels produce fewer polluting emissions when burned compared with traditional fuels. Trials of Shell GTL Fuel have taken place in heavily congested cities. The trials demonstrated that buses, taxis and trucks running on Shell GTL Fuel can help improve local air quality, as it produces less polluting emissions than conventional diesel. Shell GTL Fuel is available to business customers in Germany and the Netherlands. Pearl GTL, in Qatar, is the world’s largest gas-to-liquids plant. The plant uses heat generated by its processes to convert water into steam, which drives its compressors and generates electricity. Its water-recycling system is the largest of its kind and recovers, treats and reuses all of its industrial process water. It can process 45,000 cubic metres of water a day – comparable to the water use for a city of 140,000 people – without discharging liquids from the plant.